This article provides detailed instructions of how to manually set up whitelisting (blocking all sites except one) on your desktop computer. Important update: Freedom now supports desktop whitelisting on our Mac clients. if you're using a Mac, please visit our updated document to learn how to whitelist sites. This document is still useful for Windows users, and in certain cases, using a proxy-based approach to whitelisting is still useful on Macs. If you are using Windows, or if we sent you this document to solve a Mac whitelisting issue, please read on. I want to block all websites but allow one or a few through. We're commonly asked if Freedom supports whitelisting (blocking all sites except one). We realize this is a very important feature, and we are developing whitelisting and hope to integrate that into Freedom within the next several months. In the meantime, there are some ways to use Freedom as a whitelist. Block all websites, but allow email, Spotify, Pandora, Dropbox, etc. Mac Instructions: To block all websites, but allow streaming services/printing/email to work in the background, open up the app and choose Options → Advanced Options → and ensure that "Block All Internet Connectivity" and "Block Email and Chat" are not selected. Windows Instructions: Make sure that any services you want to use are set to NOT use the system proxy. This will allow the apps to bypass the Freedom block. Other apps - ensure they are not using the system proxy, and they should be able to connect. 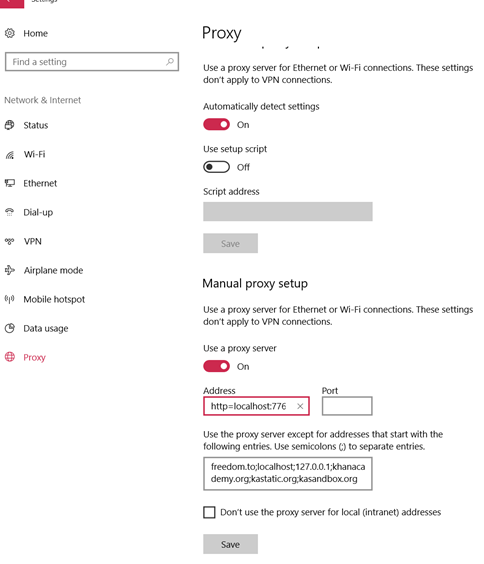 You can create a whitelist by adding a proxy exception to your computer. Please note - this is a slightly complex process. Let's say you want to whitelist khanacademy.org. Important: The browser plugin is incompatible with whitelisting. Please disable the Freedom browser plugin if you wish to white-list. On your Mac, open up System Preferences → Network → Advanced → Proxies. You're going to add some addresses to the field "Bypass proxy settings for these hosts & domains." In this field, you'd add *.khanacademy.org, *.kastatic.org, *.kasandbox.org - making sure there is a comma before each site. You're going to add some addresses to the field "Use the proxy server except for addresses that start with the following entries. Use semicolons to separate entries"
In this field, in addition to what is already there, you'd add khanacademy.org; kastatic.org; kasandbox.org - making sure there is a semicolon between each site. Now - why not just khanacademy.org? This is where whitelisting gets complex. A website often loads content from many different pages, and for a page to work properly, all of the sites that the original page loads from need to be allowed. 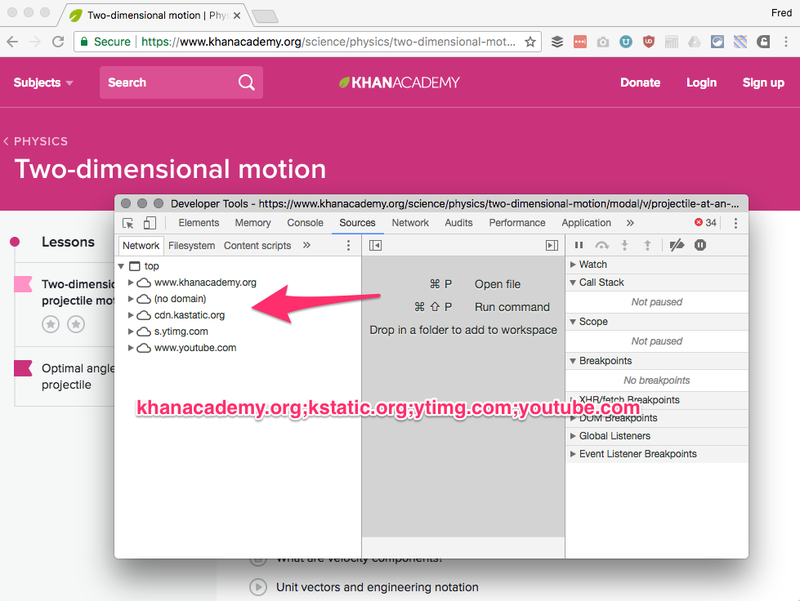 When we loaded the Khanacademy site, we were able to see that we needed to add in two other sites for whitelisting. Each site will be different. You can find all the sites you need to whitelist by opening up the chrome inspector and checking all the sources for the page. To do this, right click on a website in Chrome, choose Inspect, and then click on the tab Sources. You will need to add these sites to the whitelist. If the inspector shows a site www.foo.com loading, add it to the bypass as *.foo.com (mac) or foo.com (windows). We realize that this manual whitelisting process may be difficult for users - time allowing, we can help our premium customers research and identify whitelist solutions! Just email us or click on the green support chat bubble in the bottom right corner of this page. Please note that whitelisting as an integrated feature is now available for Mac via the Website Exceptions feature! Whitelisting for Windows is still in development and we hope to get that integrated soon as well. Did this answer your question?